The live feed can be found when viewing the campaign results; Live Feed is the 3rd tab along. The live feed gives you information such as opens, click rates, device breakdown, and user-specific records of interactions with your campaign. NOTE: The live feed will continue to run even when campaign has closed. This is the live feed overview, which shows you statistic about your campaign, such as web clicks, opens or landing zone clicks. 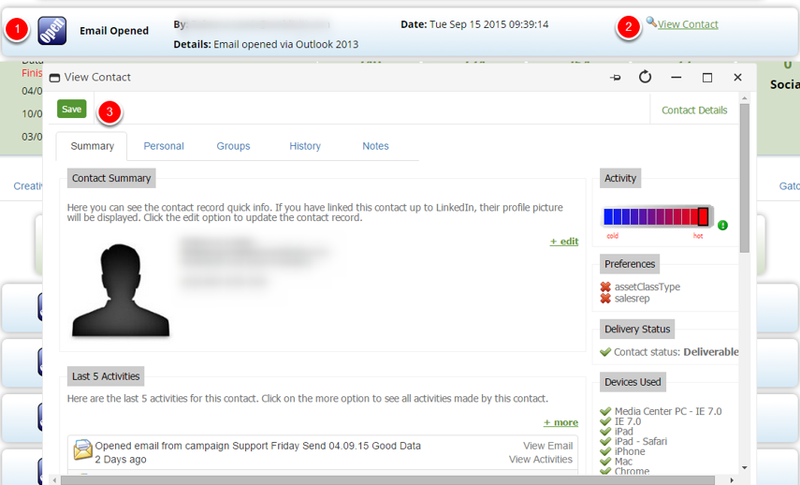 This brings up the contact record, which takes you to the Summary page where you can view the contact summary. Last 5 activities and last 5 campaigns that were sent to this contact. 1. If you want to view specific results on the live feed, such as landing zone clicks and unsubscribes, select the preferences you would like. 3. View the contact record. 1. When the play button is clicked, this means that the feed is active. 2. When the pause button is clicked, this means that the Feed has been paused. 3. When the refresh button is clicked, the Feed is active again and updated.